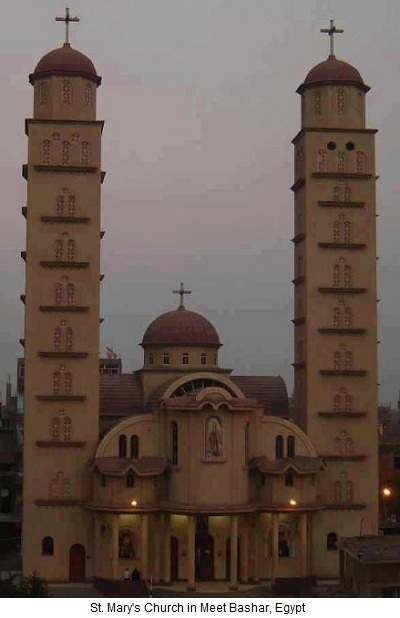 (AINA) -- A mob of nearly 20,000 radical Muslims, mainly Salafis, attempted this evening to break into and torch the Church of St. Mary and St. Abram in the village of Meet Bashar,in Zagazig, Sharqia province. They were demanding the death of Reverend Guirgis Gameel, pastor of the church, who has been unable to leave his home since yesterday. Nearly 100 terrorized Copts sought refuge inside the church, while Muslim rioters were pelting the church with stones in an effort to break into the church, assault the Copts and torch the building. A home of a Copt living near the church and the home of the church's porter were torched, as well as three cars. Some Coptic eyewitnesses said that a number of Muslim villagers tried to prevent the Salafis from assaulting their Christian neighbors and some stood as human shields to protect the church, until security forces arrived. Bishop Yuaness, Secretary to Pope Shenouda III, said this evening that they have been in contact since yesterday with authorities "at the highest levels." Ms. Marian Malak, a Coptic member of parliament, contacted the Egyptian prime minister El-Ganzoury, who ordered sending reinforcements to contain the crisis. Bishop Tadros Sedra, of Minia el Kamh and Zagazig Coptic diocese, said this evening that military and police forces have arrived in great numbers and have dispersed Muslims from outside the church and the home of Reverend Guirgis Gameel. He confirmed that security will stay in the village for at least two weeks. US-based Coptic Solidarity International, issued a press release today strongly urging the international community, through the United Nations Human Rights Council, to appoint a special rapporteur for the Copts in Egypt, particularly in light of the recent evictions, property confiscations and attacks against Copts (AINA 1-28-2012).